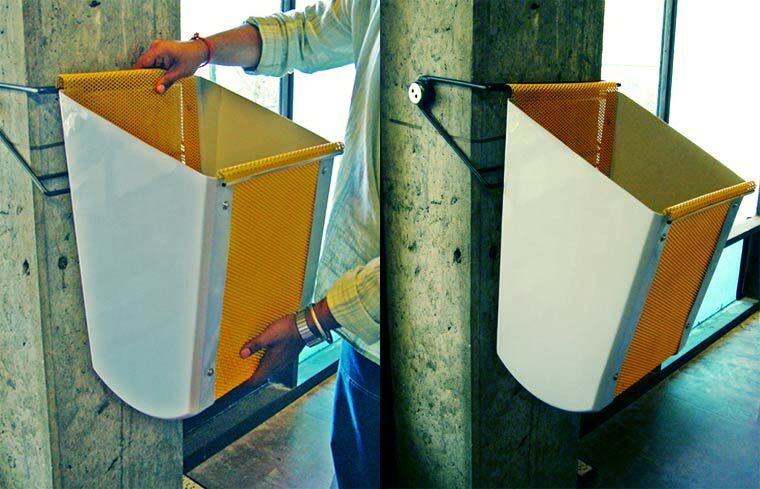 This was a classroom project to make waste collection system for studios of National Institute of Design. It was a group project with my friend Sumit Saini. To understand the specific problems related to NID studio we observed the existing system thoroughly. Being part of the system and user of the studios and the existing dustbins as students was added advantage for us. Old metallic containers (drums) were used as dustbin, which was not aesthetically pleasant and generally ignored by the users. The users used to through liquids like tea, coffee cups etc which used to make it more dirty. As it’s not for mass production the manufacturing process should be adaptable for limited number of production. In the next stage lots of concepts were derived. 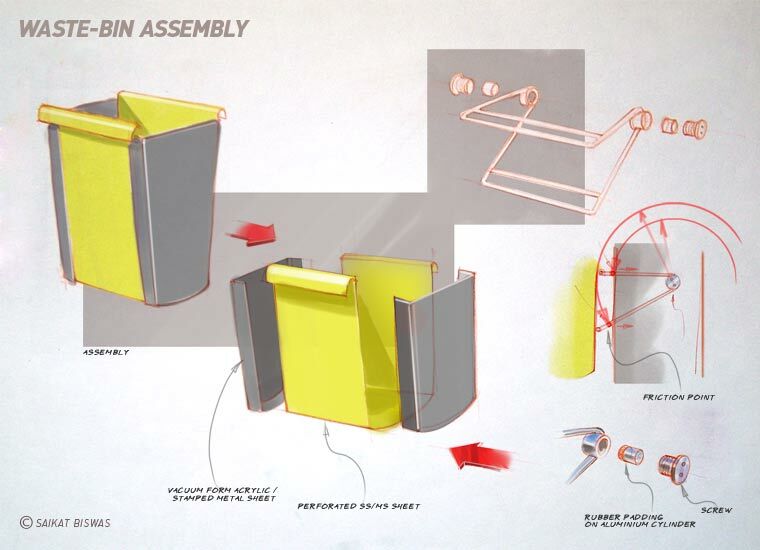 One of the sorted out idea was attaching the waste collection bin at certain height to the square columns which is one of the identity of the NID’s architecture and common in all its studios. This would help the users to remember where exactly the bin is located and people wouldn’t be able to move it around. Because of the height it would be easier to locate the bins easily unlike the existing one which gets hidden under the desk most of the time. But there was one problem; we were not supposed to make any hole on the columns. We could not use any idea of clamping it around, as in many cases only half the column was inside the studios, other half was in some other studio, outside the wall or outside the window. This was one stage where the project faced some difficulty. Then the breakthrough came as a new concept of ‘pivot clamp’ was developed. This is a rectangular structure which holds the column tightly from two sides using two rubber padded screws. 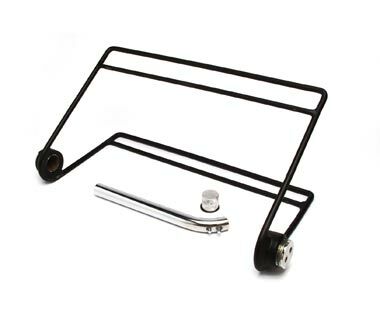 The rubber padded cylinder inside the screws enables the structure to rotate and keeping the pressure on. When some weight, that is the dustbin, is fixed in front of it, it puts pressure on the front surface causing friction between the front surface and the supporting members which stops it to move downward. More the pressure more the friction; enabling it to carry a lot of weight without sliding down. The bin is made of one bent perforated sheet held from both sides by two vacuum formed polystyrene sheets (it could also be replaced by stamped steel sheet metal) using 10 screws having chrome plated hemispherical screws. This also makes it suitable for small scale production. 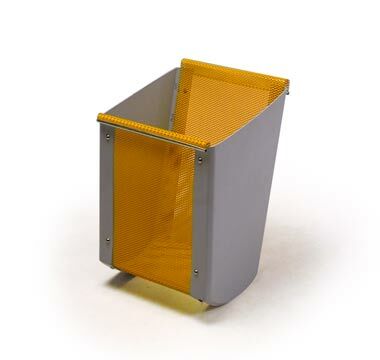 The bottom of the bin has a curved form so that it cannot be kept on floor, this make it virtually theft-proof. As the bin has perforated bottom no liquid waste could be discarded in it which is going to discourage users throwing liquid waste in it keeping the bin as well as the studios cleaner. 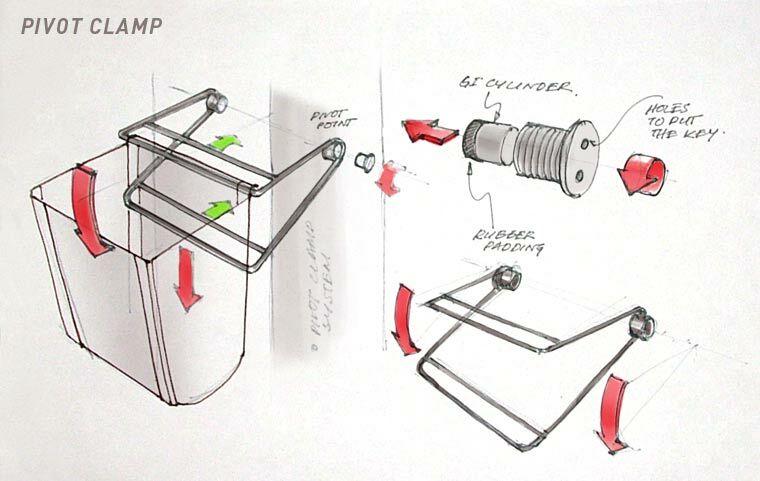 << Working prototype of the Pivot-Clamp; with the key to open and close the clamp and the rubber-padded cylinder. 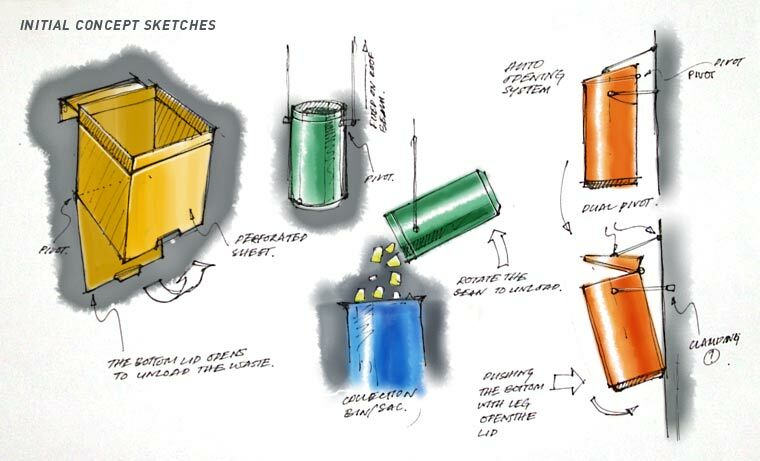 << Working prototype of the waste collection bin. It is made of perforated GI sheet, enamel-painted in yellow; the sides are made of vacuum-formed 3mm polysyrene sheet.